Crossover SUVs are more popular than ever, offering families another option besides the minivan for hauling people and their things around town. When you’re looking for a combination of an outstanding people hauler and an outstanding cargo carrier, the 2018 Kia Sorento is your best option. The 2018 Sorento looks the way you would expect a refined SUV to look-athletic, luxurious, and aerodynamic. A dark front grille and bold styling emphasizes the powerful look of the Sorento, as does the chrome detailing and stocky stance. Body colored mirrors and LED turn signals, as well as a panoramic sunroof, Smart Welcome, and Smart Liftgate give an air of sophistication and luxury. The Sorento stands out in a crowd. The inside of the Sorento is thoughtful and sophisticated, anticipating what drivers and passengers want. Drivers will enjoy steering wheel mounted controls, USB charging ports, and 12-volt charging areas as well as remote keyless entry with the available SmartKey. Passengers will enjoy 154 cubic feet of room to stretch, along with privacy and sound-absorbing glass. 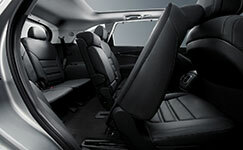 The Sorento can come equipped with either room for five or seven, with an optional third row. Looking for room to stash some stuff? Try the double-decker cargo area, with an under-cargo floor storage area for valuables you’d like to keep away from prying eyes and 38.8 cubic feet above it. If you’re like most families, you’re on the go a lot. Stay easily connected with family, friends, or work in the 2018 Sorento. You’ll get the standard Bluetooth connectivity that will allow you to answer calls without taking your eyes off the road, as well as Android Auto and Apple CarPlay for complete smartphone integration. Need directions? Voice-activated navigation can be accessed as well as your smartphone apps through your touchscreen. Add a layer of safety technology with an entire package of active driver helps, including parking assist, blind spot detection, smart cruise control, and collision warnings. The 2018 Sorento offers so much more than just style and technology-it’s an incredible vehicle to drive as well. You can opt between two different engines, a 2.0L 4 cylinder and a more powerful 3.3L V6 that more than doubles the horsepower. Every Sorento has all-wheel drive as an available option, which also significantly increases the towing capacity (up to 5,000 pounds). A Sportsmatic sports shifter gives you the feel of a manual transmission and the ability to shift between gears manually, but with an automatic transmission option so you can decide for yourself which option feels right depending on the day. Take the 2018 Kia Sorento and take it up a notch–that’s what the SX Limited does. Nappa leather seats, all the safety technology you can imagine, leather and wood trim, stainless steel pedals, and 19-inch chrome wheels create a luxury experience that few can rival. Get easier access to the third row with Kia’s wisely engineered second row. 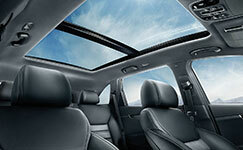 Expand the sunshine into the bulk of the cabin of the Sorento with the panoramic sunroof option. 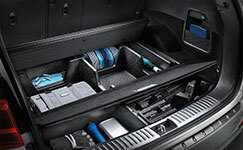 Stash your stuff in two places–under the floor of the cargo area or above it, giving you additional storage options that other SUVs don’t have. 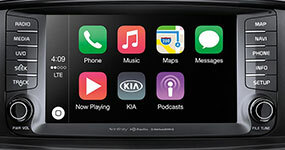 Control your navigation, smartphone apps, and other services from the touchscreen in the dash. The 2018 Kia Sorento is an SUV that offers you real towing capacity, room for up to 7 passengers, and some serious cargo chops. Add to this its impressive styling and you have a full-size SUV that can compete with (and likely defeat) any of its competitors.